Cloe's affection for the Maltese Islands comes from her ancestors. Her father was born there, and she was named for her paternal grandmother. She visited these islands for almost twenty years before creating Goddess Tours To Malta in 1992, thus combining her interest in art and architecture, her fascination with the feminine-based spirituality of the ancient Neolithic and its inspiration for modern-day women's issues. She reflects, "I just couldn't get enough of the place! Once I met my godparents and discovered the temples, I kept going back year after year, until I'm sure they were sick and tired of seeing me! But I couldn't stay away! There was so much to learn, to see, and to feel. Yearly visits were not enough, so I started Goddess Tours To Malta, but soon that wasn't enough either. Every visit, when it came time to leave Malta, I was filled with such a deep, unspeakable sadness. It was like leaving part of my heart and soul behind. I was finally compelled to move to Malta in 1995, in order to spend more time exploring and researching the archaeology and spirituality of the Neolithic period and the joys and delights of modern-day Maltese life. I have never regretted that choice!" Originally from New York City, Cloe has worked in the travel field for many years, first as Social Directress for American Export Isbrandtsen Lines passenger ships ssConstitution and ssIndependence, followed by starting her own travel business Safari Superlative, organizing small group photographic safaris to East Africa. She is a frequent speaker at Women's Studies classes at colleges and universities, and women's discussion groups throughout the United States, Canada and England. A graduate of The Spence School and Finch College in New York City, and Duke University in North Carolina, Cloe holds degrees in Art History and Psychology. 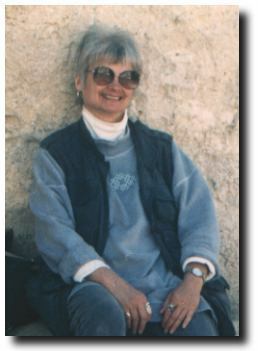 Her favorite pastimes are researching aspects of Maltese history and folklore, feminine spirituality and how it manifests in ancient and modern-day Maltese society (including the many caves, grottos, and miraculous Marian sites so abundant in Malta), Black Madonnas in Malta and the Mediterranean, and sharing her findings and insights with interested visitors. Her love of photography finds many avenues of expression, including photographic series of Medieval and Baroque architecture, the proud but aged Maltese buses and trucks, antique Maltese lace and ganutil (an 17th century European decorative artform, of delicate floral arrangements made from gold and silver wire, small beads and satin thread, created originally for church altars), luzzu (fishing boats), village festas (especially those celebrating the Virgin Mary), ghana (traditional folk music), and the multitude of celebrations which occur around the islands throughout the year. Cloe's life journey has led her to the colorful homeland of her ancestors. She delights in the ongoing exploration and discovery of local traditions and passtimes, which prove to her the authenticity and continuity of the unusual energy of these sacred islands, venerated for more than six thousand years.